On Friday, September 21, I hosted a Senate Majority Policy Committee roundtable discussion focused on school safety efforts at Quakertown Community School District. The committee, chaired by Senator David G. Argall (R-29), heard from teachers, students, administrators and others. The public roundtable discussion included Rep. Craig Staats (R-145) and featured a brief summary of recently passed legislation, pending proposals that are awaiting action by the General Assembly and a focus on new school safety solutions from local participants. A complete list of participants and video of the event can be found on my website at SenatorMensch.com. Representative Ryan Mackenzie and I will be hosting a Concealed Carry Seminar on October 11, 2018 from 6 p.m. to 8 p.m. at the Community Fire Company #1 of Seisholtzville, 24 Saint Peters Road, Macungie, PA 18062. Attendees will learn the facts about Pennsylvania’s concealed carry laws, the Castle Doctrine, your Second Amendment rights, firearm estate planning, how to safely interact with police while carrying, and how to obtain a concealed carry permit. Seating is limited. To register, call Rep. Mackenzie’s office at 610-965-9933 or register online at www.RepMackenzie.com. 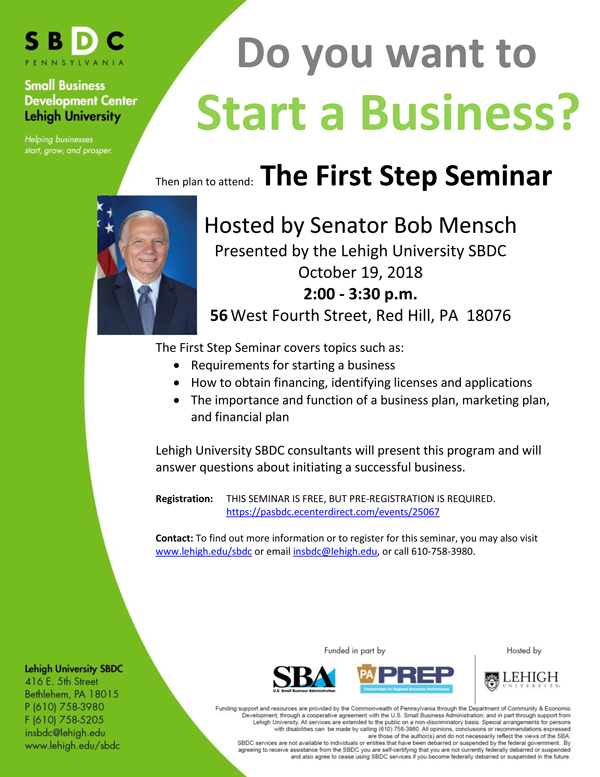 On October 19, I’ll be hosting the “First Step Seminar” to provide information on starting a business. The seminar will be held from 2 p.m. to 3:30 p.m. in the Red Hill Borough Council Chamber located at 56 West Fourth Street in Red Hill. On November 3, 2018, I will be hosting my annual Veterans Appreciation Breakfast at the Upper Perkiomen High School located at 2 Walt Road, Pennsburg, PA 18073. Veterans are invited to join me for breakfast to honor the military men and women who have served our country. The Keynote Speaker will be Chaplain Lieutenant Colonel John W. Groth, USA, Retired. Seating is limited so please register before Thursday, October 25. Veterans should register themselves and up to one. To register, visit https://www.senatormensch.com/veterans-appreciation-breakfast/ or call 215-541-2388. My September e-newsletter introduced you to the TriCounty Active Adult Center in Pottstown. Part II looks at the center’s meal program, and Part III highlights exercise and recreational programs. October 9 is the last day to register to vote before the November 6, 2018 election. You can register online or complete a voter registration form and submitting it to your county board of elections. The Pennsylvania Department of Agriculture (PDA) has been working on addressing the latest invasive species pest that threatens our natural habitats, managed landscapes, and farms and forests – the spotted lanternfly. This is potentially the worst invasive pest since the introduction of the gypsy moth nearly 150 years ago. The Asian planthopper was found for the first time in the United States in Berks County, Pennsylvania in 2014. It has since spread throughout 13 counties in southeastern Pennsylvania, currently under quarantine, and has recently been found in New Jersey and Virginia. This insect threatens not only about $18 billion of agricultural products in Pennsylvania, but it can make outdoor areas unusable by excreting a sticky substance called honeydew, which serves as a host for sooty mold. Furthermore, the presence of spotted lanternfly could threaten the shipment of goods over state lines and from the port of Philadelphia, should restrictions be placed on the movement of Pennsylvania products. Since it is new to the United States, little is known about its behavior and biology, but researches in the Penn State College of Agricultural Sciences and United States Department of Agriculture (USDA) are working tirelessly to gather scientific data on how to contain and manage this pest. The PDA and USDA are leading the strategy and implementation of containment and control efforts, while the college focuses on research, education and outreach. Working with PDA and USDA, Penn State Extension has launched a spotted lanternfly website – extension.psu.edu/spotted-lanternfly – that serves as the primary hub for the most up to date information on this insect. To help stop the spread, the public can visit the website to learn how to identify spotted lanternfly and to report any potential sightings for action by PDA. You will also find an online course that provides businesses with the necessary training to receive a PDA permit that is required for companies operating in the quarantine zone to move equipment and goods within and out of the zone. Constituents can also call the SLF hotline at 1-888-4BADFLY (1-888-422-3359) to get information and report a sighting.